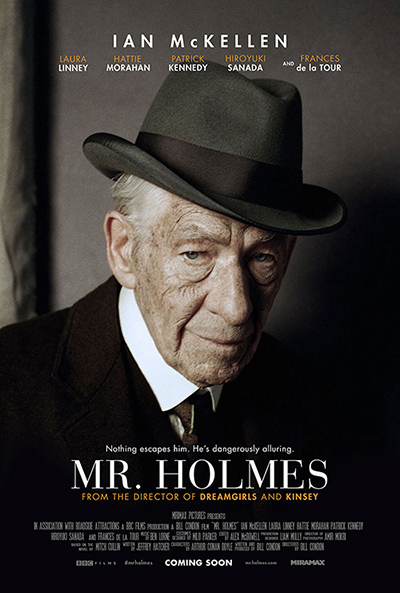 Sir Ian McKellan becomes the latest actor to embody the legendary Sherlock Holmes in Bill Condon’s Mr. Holmes. This version is a bit of a departure from the recent Robert Downey Jr. or Benedict Cumberbatch portrayals of the character as the film depicts him at the end of his life. There’s a subtle tragedy to the film here as Holmes is very much in the twilight of his years waiting for the end to come while quickly losing his faculties. His friends have long left him as have his once sharp faculties. Most of the film focuses on his struggle to remember the details of his final case as something terrible enough to force him into retirement must have happened. The case is depicted through periodic flashbacks as Holmes recalls the case piece by piece throughout the film. I found these to be effective if a little unnecessary. They do succeed in showing an obvious contrast between Holmes as one of the sharpest men on the planet and the man who struggles to fend for himself. Of course any casual observer would have a fair idea of what Sherlock Holmes was like in his prime so the flashbacks weren’t entirely necessary but they were effectively used nonetheless. McKellan is excellent in the lead role and embodies the Holmes in any stage of his life perfectly. His constant nuggets wisdom reminded me a little of Gandalf but that’s probably more my problem than anyone else. The best scenes in the film involved Holmes showing a little vulnerability as the fear associated with his upcoming death as well as his loss in memory catches up with him. I also found myself oddly engaged by his beekeeping hobby. I’m not about to start practicing it myself but as an obsession for him to carry into his old age it proves appropriate for the character. His relationship with his housekeeper’s son Roger (Milo Parker) rests at the heart of the film. In some ways it feels like he’s trying to train a successor but I took it as just having a fondness for someone so young and wanting to arm him with everything he’ll need to take on the world in the absence of a father figure in his life. It’s a very sweet relationship to watch unfold as Holmes gets to impart his wisdom and Roger challenges him in ways that remain unexpected to the elderly former detective. I also enjoyed how this film played with the mythology surrounding the character. In this version the works of Sir Arthur Conan Doyle are works of fiction written by Holmes’ former partner Dr. John Watson -who sadly doesn’t appear here- and according to Holmes have missed the point entirely. He seeks to put right the image of the deer stalker hat and pipe. He does say he enjoys a pipe but really hated the cliché so had to stop. There’s a great scene where he goes to watch a film version of one of his cases and laughs at the absurdity of it all throughout. It all contributes to a sense of getting to the man behind the legend and the film does a great job of putting that across. Not everything about this film works though and there are some parts that stick out as being particularly weak. His final case struck me as being a little mundane and while the resolution was dramatic enough part of me feels that Sherlock Holmes should have something more shocking force him into retirement. A subplot involving a trip to Japan could have been left out entirely as it comes across as clumsy and feels completely tacked on. Similarly a present day mystery surrounding the spontaneous death of some of his prized bees fails to impress. I also had issues with Laura Linney as moody housekeeper Mrs. Munro. Her accent was all over the place and her character felt like more of a nuisance than anything else. Maybe Holmes keeps her around so that he is forced to keep his wit sharp in arguing with her all the time. In any case she is the least engaging character here. Despite the flaws this film is an intriguing character study with the character of Sherlock Holmes depicted in a way that feels familiar yet different. I truly felt that this was a continuation of the more traditional version found in the books. An interesting character study depicting one of literature’s most famous figures as he approaches the end of his life. Sir Ian McKellen excels as this character throughout as he is tasked with embodying Holmes at different points in his life. Flashbacks depict his final case throughout as he works to remember the details of it as a final mission before he dies. The flashbacks do a good job of showing the contrast between the sharp genius and the old man who is swiftly losing his memory and has become something of a shadow of his former self. McKellen is at his best when portraying Holmes as a vulnerable old man who seems legitimately afraid of losing his grip on everything that defines him. Much of the film focuses on the friendship between Holmes and the son of his housekeeper. Holmes becomes something of a father figure where Roger doesn’t have one and he is fascinated by the stories of the famous detective as well as enjoying the company of the old man his mother looks after. The film plays around with the famous mythology in clever ways as Holmes works to set the record straight before he dies. There are some great moments where the common imagery is played around with in amusing ways. Some parts of the film don’t work quite as well such as Laura Linney’s Mrs. Munro who comes across as needlessly disapproving. A present day mystery also feels out of place and Holmes’ final case feels a little underwhelming when all is revealed. A pointless subplot involving a trip to Japan drags the whole thing down as well. Despite the flaws it’s a really entertaining film with great performances and provides an interesting perspective on the traditional Sherlock Holmes character.